I never really had a complicated skin care regime when I was younger – usually I would use just face wash and a little moisturizer before applying my makeup. As I’m getting older, I can see that my skin needs a little more help than I’ve given it in the past. I like to do my research and make sure I’m using the best possible products on my skin, so what I read about OZ Naturals really impressed and intrigued me and I was excited to be able to try a few items from their line of skin care products. OZ Naturals is a company committed to using only natural and organic active ingredients in their products – as a matter of fact, all of their products are 100% vegan, cruelty-free, paraben-free, sulfate-free, mineral oil-free, lanolin-free, gluten-free, and GMO-free. . Every one of their product formulations undergoes extensive clinical testing before being released to the public in order to make sure that each product is extremely effective in what it is meant to do – I like that kind of commitment from a company, it really shows me that they care about their product and their customers. All of their products are produced in the USA, in small batches, and are packaged under secure and sterile conditions in order to ensure optimal potency and freshness. Their formulations have been proven to correct signs of aging, protect healthy skin, and prevent future damage from occurring. * Super Youth Eye Gel ($17.49) – my eyes have become such an issue as I’ve been aging. I notice a lot of puffiness and dark circles, especially since having children! This gel is made to address puffiness, dark circles, and wrinkles. I like that it’s lightweight and almost instantly disappears into my skin. This cream is gentle and hydrating, and after using it for just 2 weeks, I can really see a difference in the brightness and puffiness of the skin around my eyes. I’m super happy with this product and will keep this as part of my daily routine from now on! I use a little bit in the morning, and apply a little before bed as well. * Vitamin C Serum ($22.49) – this serum is made to work deep down below the skin’s surface to aid your skin in naturally producing more collagen. It hydrates and moisturizes skin while its antioxidant formula protects the skin from environmental stressors. I think this product does a great job in keeping my skin feeling hydrated – I usually end up having to use a ton of moisturizer to make my dry skin feel good, but just a little bit of this serum combined with just a little of my usual moisturizer does that job. I like the way it makes my skin feel and it’s also a very lightweight product that’s easy enough to incorporate into my daily skin care routine every morning. * Hyaluronic Acid Serum ($16.45) – I use a little bit of this at night. Among other benefits, this formula is made to help speed up skin-cell turnover, keeping new and healthy skin on the surface. I think it compliments the Vitamin C Serum quite well and it too is lightweight and quick-absorbing. What’s neat about all of these products I received is that I didn’t have to change anything in my normal makeup routine in order to incorporate them into my daily regime. These products are meant to work on your skin while you use your regular makeup and moisturizers. I have very sensitive skin and was worried about having some sort of reaction to these items, but my skin performed very well, and I experienced absolutely no irritation while using these products. I also like the price-point of these products. If you’ve been to the department store makeup counters you know these types of items can be very pricey! I think OZ Naturals does a good job of proving that you don’t need to spend a lot of money for great results. Check out the OZ Naturals website to learn more about their products. You can also find them on Facebook and Twitter. I really like these all natural items. They sure look like they can really help my skin. I like the Vitamin C serum the best! When my skin feel dry I use coconut oil,it works great ! All natural products are great. I love the fact that it is all natural. OZ Naturals is a brand that’s new to me, but I’d love to give it a try, I’d try the Vitamin C Serum. 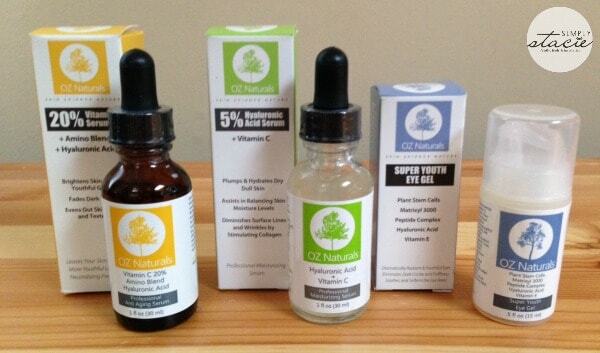 Vitamin C serums tend to be expensive but OZ Naturals is not as expensive as most. Thank you for sharing this review. Adore my skincare products, especially having super dry skin. Would love to give this one a try. These products sound lovely! I love how they are made from natural ingredients. 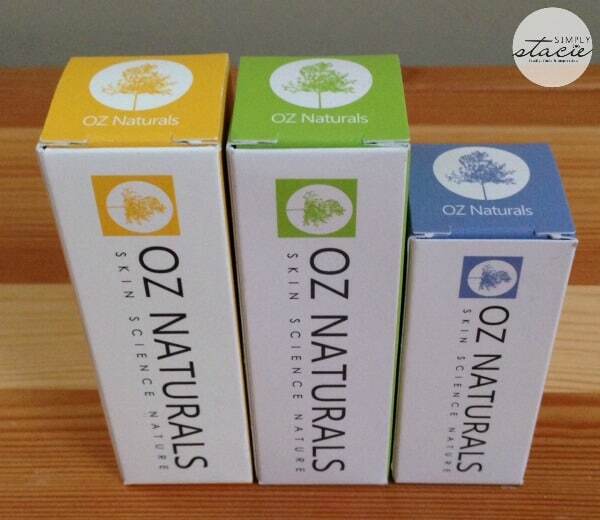 I love hearing about new skincare products like Oz Naturals! These sound really good…lightweight, nutrients, and hydrating. I like how you saw results after two weeks of use. Makes you feel good. I am similar to you as far as I didn’t to much for skin care when I was younger. Well now it’s a different story. I like that these products are natural. I have super sensitive skin and have to be very careful. I would love to try the eye serum. These products sound really nice but what sold me is that they are made in the USA and that they are cruelty-free. That’s a big seller for me. I’ve never heard of these products before, but they look like they’d be really good to try! I have never had a problem with my skin until recently. Not sure if its what I am eating, or that fact that I only used soap and water to wash my skin and now it has taken its tole. These skin care products sound like something that I could use. I will be checking them out a little bit more. Thank you for the review! our skin absorbs what we put on it, so not using chemicals only makes sense. I love using natural products for my skin. For years I had used benzagel and noticed all it did was dry and age my skin. I switched to natural and my skin looks so much healthier. These products look great. I could really use the Super Youth Eye Gel! I was putting my makeup on the other day, and I noticed, for the first time, that I am getting wrinkles!! I am only 25! I guess I better start using some anti aging creams, yikes! This sounds like something that could be good for my face. Anything I use has to be simple because I just don’t like having to do too many steps. I’ll be 50 in a couple of weeks and would like to at least maintain my skin’s appearance. I would love to try their Vitamin C serum, I too need to give my skin more attention now that I am getting older. Thank you so much for sharing this! I’ve been looking for this type of products (natural, non-aggressive) for some time. I really need something to keep my skin hydrated; will try this! Many things in this line offer something extra.Will look out for these in my travels for sure!